Some functions are not available in Windows system and they can be carried out in DOS system. DiskGenius provides a function that even in Windows you can boot to its DOS version without using boot CD, bootable USB Flash Disk or installing DOS on the hard drive. Disk partitions displayed by DiskGenius in DOS version are the same as they are in Windows version. When you restart the computer, it boots to the current Windows system. 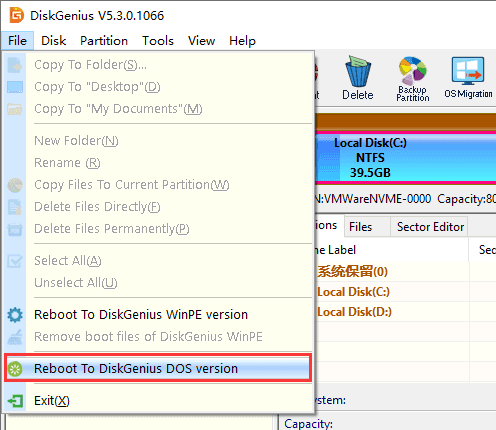 Step 1 To boot to DiskGenius DOS version, click "File" → " Reboot to DiskGenius DOS Version". Step 2 Close all other applications and save data, and click OK button. The master boot record of the disk will be modified temporarily. If it is stopped by security software, please select "Allow". If your computer cannot boot to DOS system or cannot boot to current system, please press and hold the "ALT" key during booting. After system is booted, do "rebuild MBR" command on the startup disk. When you finish operations in the DOS version, you can turn off or restart the computer; the computer will boot to Windows system automatically.